Edmond Montague Grant (born 5 March 1948) is a Guyanese-British vocalist and musician. He was a founding member of the Equals, one of the United Kingdom's first racially integrated pop groups. He is also known for a successful solo career that includes the platinum single "Electric Avenue". He also pioneered the genre ringbang. Grant was born in Plaisance, British Guiana, later moving to Linden. His father, Patrick, was a trumpeter who played in Nello and the Luckies. While at school, his parents lived and worked in the United Kingdom, sending back money for his education. In 1960, he emigrated to join his parents in London. He lived in Kentish Town and went to school at the Acland Burghley Secondary Modern at Tufnell Park, where he learned to read and write music. He became a big fan of Chuck Berry, and after seeing him play at the Finsbury Park Astoria decided on a career in music. In 1965, Grant formed the Equals, playing guitar and singing background vocals, and the band had two hit albums and a minor hit with the single "I Get So Excited" before having a number one hit in 1968 with his self-penned song "Baby Come Back". The tune also topped the UK Singles Chart in 1994, when covered by Pato Banton featuring Robin and Ali Campbell of the reggae group UB40. The Equals had five further top 40 hits in the UK up to the end of 1970. The Baby Come Back album featured a song by Grant titled, "Police on My Back" which was recorded by the Clash for their 1980 album Sandinista!. Willie Nile released his version of "Police on My Back" on his Streets of New York CD. The Equals' song "Green Light" co-written by Grant from their 1968 album Supreme, was recorded by the Detroit Cobras, for their 2007 album, Tied & True. In this period he also worked as a songwriter and producer for other artists, including the Pyramids (producing their debut single "Train Tour to Rainbow City") and Prince Buster, for whom he wrote "Rough Rider", and started the Torpedo record label, releasing British-made reggae singles. On 1 January 1971, Grant suffered a heart attack and collapsed lung, leading to his departure from the Equals to concentrate on production, opening his own Coach House Studios in the grounds of his Stamford Hill home in 1972, and starting Ice Records in 1974, initially distributed by Pye Records and later by Virgin Records. He produced the Pioneers' 1976 album Feel the Rhythm, as well as early recordings by his younger brother Rudy, working under the name the Mexicano. During this time he also branched out of music, learning to tap dance, and subsequently trying his hand at acting at the behest of fellow Guyanese immigrant, actor Norman Beaton. A self-titled solo album released in 1975 made little impact, nor did the proto-soca Message Man, completed and released in 1977, on which Grant played all the instruments himself. His breakthrough as a solo artist came two years later with the album Walking on Sunshine, which spawned the UK top 20 hit "Living on the Frontline". He returned to the charts in 1980 with the top 10 hit "Do You Feel My Love", the opening track of Can't Get Enough, the 1981 album giving him his first entry in the UK Albums Chart. The album included two further hit singles, "Can't Get Enough of You" and "I Love You, Yes I Love You". Grant became based in Barbados from 1982 (where he opened his Blue Wave Studios), the same year releasing his most successful album, Killer on the Rampage, which included his two biggest solo hits, "I Don't Wanna Dance", which spent three weeks at number one in the UK as well as selling well internationally, and "Electric Avenue", which reached no. 2 in both the UK and the US. He also began producing and promoting local artists such as David Rudder, Mighty Gabby, Tamu Hibbert, and Grynner. A lean period followed; his 1984 theme song for Romancing the Stone was cut from the film and stalled outside the UK top 50 when released as a single, although it fared better in the US. His albums Going for Broke (1984), Born Tuff (1987), and File Under Rock (1988) failed to chart and produced no further hit singles. He returned to the charts for the last time in 1988 with the anti-apartheid single "Gimme Hope Jo'anna", a no. 7 hit in the UK, his last hit to date. The song was banned by the South African government. In the late 1980s he pursued other business interests including music publishing, and a nightclub, and built up the success of his Blue Wave studio, which was used by the Rolling Stones, Sting, Cliff Richard, and Elvis Costello. He continued releasing albums in the 1990s, including Barefoot Soldier (1990), Paintings of the Soul (1992), Soca Baptism (1993), and Hearts and Diamonds (1999). In 1994 he introduced a new genre, ringbang, at the Barbados Crop Over festival. Grant said of ringbang: "What ringbang seeks to do is envelop all the rhythms that have originated from Africa so that they become one, defying all geographical boundaries." In 2000 he organised the Ringbang Celebration festival in Tobago, and in 2001 he released a Greatest Hits album. In 2006 he released the album Reparation. In 2008, Grant performed at Nelson Mandela's 90th birthday concert, and also played several dates in the UK, including the Glastonbury Festival. In 2016 it was announced that Grant would receive a lifetime achievement award from the government of Guyana. ^ a b Greene, Jo-Ann (5 March 1948). 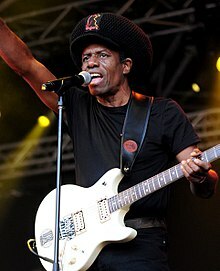 "Eddy Grant – Music Biography, Credits and Discography". AllMusic. Retrieved 2 July 2013. ^ a b Gregory, Andy (2002), International Who's Who in Popular Music 2002, Europa, ISBN 1-85743-161-8, p. 202. ^ Roberts (2006). British Hit Singles & Albums. p. 42. ^ Simpson, Dave (3 September 2018). "How we made Eddy Grant's Electric Avenue". theguardian.com. Retrieved 3 September 2018. ^ Rollins, Scott. "Eddy Grant Talks About Ringbang". Zeeburgnieuws.nl. Retrieved 23 April 2012.